Mill Spring, NC – The Canadian Dressage Team returned to centreline on Sept. 13 at the FEI World Equestrian Games ™ Tryon 2018 (WEG) in Mill Spring, NC for the final day of team competition, where they earned 11th place. Together, Megan Lane of Loretto, ON, Brittany Fraser-Beaulieu of Saint Bruno, QC, Jill Irving of Moncton, NB, and Belinda Trussell of Stouffville, ON earned a team total score of 206.538 in the Grand Prix to wrap up their WEG 2018 experience. Germany was crowned the winning team on a score of 242.950. The United States took silver on 233.136, while Great Britain earned bronze (229.628). Isabelle Werth of Germany topped the individual standings with Bella Rose on a score of 84.829%. 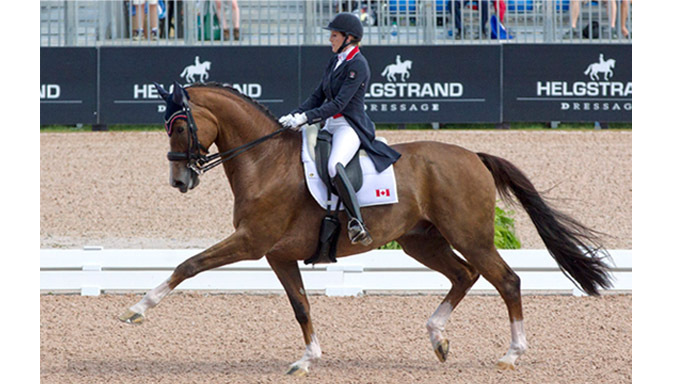 After Trussell and Irving kicked things off during day one of dressage competition, Lane and Fraser-Beaulieu closed out the Canadian performances on day two. Fraser-Beaulieu was riding high after representing the Canadian Equestrian Team (CET) as flag bearer in the opening ceremony, and her week continued to improve after she piloted All In (Tango x Damiro), a 13-year-old Dutch Warmblood gelding she co-owns with her husband, Marc-Andre Beaulieu and father, Craig Fraser, to a score of 70.016% in her WEG debut. Highlighted by high scores for individual movements, including 7.9 for one-tempis and 7.1 for extended trot, Beaulieu’s performance made her the top-placed Canadian of the Games in 33rd place, just shy of the top 30 invited forward into the Grand Prix Special on Sept. 14. 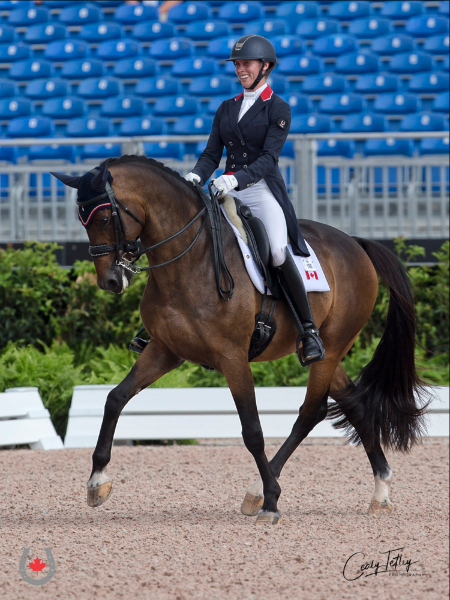 Partnered with Zodiac MW, Megan Lane of Loretto, ON completed her fourth consecutive major games for the Canadian Dressage Team at the FEI World Equestrian Games™ Tryon 2018 on Sept.13, 2018. Lane, who was also part of the silver medalist team in 2015 and competing in her fourth consecutive major games for the Canadian Dressage Team, picked up a hard-earned score of 60.901% aboard Zodiac MW (Rousseau x Amethist), a 14-year-old Dutch Warmblood gelding owned by Deer Ridge Equestrian. Canadian fans are accustomed to seeing Lane with her long-time veteran partner, Caravella, who she competed with at all levels, from Young Rider to the 2016 Rio Olympics. For the past few years, Lane has also focused on bringing Zodiac MW up through the ranks, reaching the grand prix level in early 2018. In his first major games experience, Zodiac MW had a few bobbles in the piaffe movements mid-way through the test, but recovered to finish on a high note, earning scores of 7.4 in the canter pirouettes, 7.3 for a flying change, and nailing the final piaffe. With the team competition concluded, the focus now turns to individual competition in dressage. The top 30 athletes will move forward to compete for individual honours in the Grand Prix Special on Sept. 14. From there, the 15 best-placed athletes will have the opportunity to perform their custom choreography set to music during the fan-favourite Grand Prix Freestyle on Sept. 16. As Canada did not finish among the top six teams at WEG, the team did not qualify for a spot at the Tokyo 2020 Olympics. Canada will now need to qualify at the 2019 Pan American Games in Lima, Peru.